Combine the beauty of a quilt with the luxury of a duvet by learning how to make the Dreamy Duvet Cover. Transform a quilt top into a duvet cover and choose one of the three finishing options provided in the pattern. The quilt top, based on traditional Flying Geese, is perfect for beginners and the finishing options are simple to understand for the most novice quilters. You will walk away with the knowledge of how to transform almost any properly sized quilt top into a duvet cover therefore expanding your options for integrating quilts into your home. This class is best taught as a series. 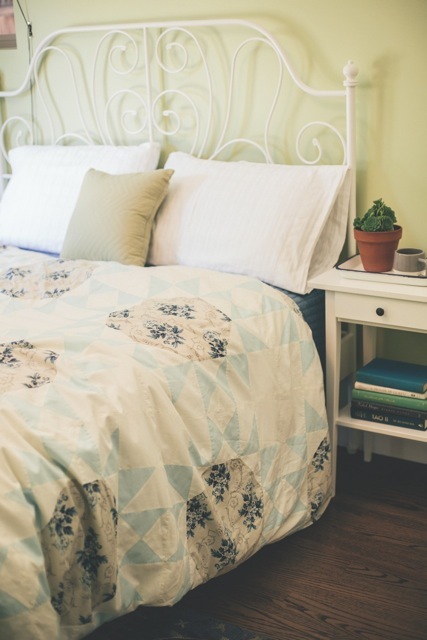 The first class should consist of creating the block, and the next two to three classes should cover the finishing options of the duvet cover. The second and third classes should be scheduled several weeks after the initial class to give students the proper amount of time to complete their quilt top. **Make students aware that if they are selecting one of the finish options that require the top to be quilted, they will need to discuss the timeline requirements if sending quilt to be professional quilted so it is returned in time for the second and third lessons. TIP: Have various sets of 1 cream, 1 solid, and 1 print displayed when advertising the class to give students an idea of how to select the colors for their duvet so it conforms to the "Dreamy Color Schemes" on page 9. It is also a great way to play with the fabrics you currently have in stock and see how coordinating them in the manner below can give the fabrics a completely different look. Each student needs a sewing machine; set up common cutting and pressing stations. I would also recommend preparing 3 small samples of the finishing options listed on page 62 so students can feel the difference in thickness and warmth before committing their quilt top to a specific finish.